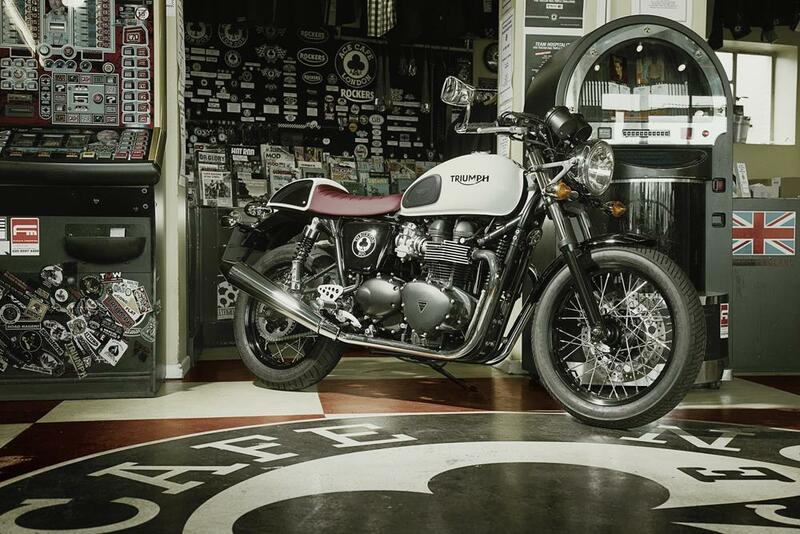 Triumph has revealed this special edition version of the Thruxton called the Ace which celebrates the link between the British manufacturer and the famous London café so synonymous with motorcycle history. The new black and white special edition was revealed on Friday at the Ace Café in London by owner Mark Wilsmore as a prelude to the Brighton Burn Up event. MCN revealed the Thruxton Ace was on the cards as a 2015 model months ago when the name (along with a couple of other models that Triumph is expected to reveal in the coming weeks) was registered as a new model for 2015 in California. The Ace gets a unique black and white paintjob, ‘Oxblood’ custom seat, bar-end mirrors, a handlebar plaque and officially sanctioned Ace Café logos and comes with the usual wire wheels and 865cc parallel-twin engine. Triumph’s press release states: “With low slung handlebars, alloy-rimmed wire wheels and a central racing stripe running along the tank to the beautifully sculpted custom seat, the Triumph Thruxton Ace looks as if it would be equally at home on a classic race grid as outside the local café after a spirited morning ride. Featuring the same engine as the renowned Triumph Thruxton, power is provided by Triumph’s 865cc signature parallel twin from the Bonneville. Producing peak power of 69PS and 69Nm of torque across a broad rev range, the Thruxton delivers its performance with a suitable increase in the edginess of the exhaust note from the classically styled chrome silencers. 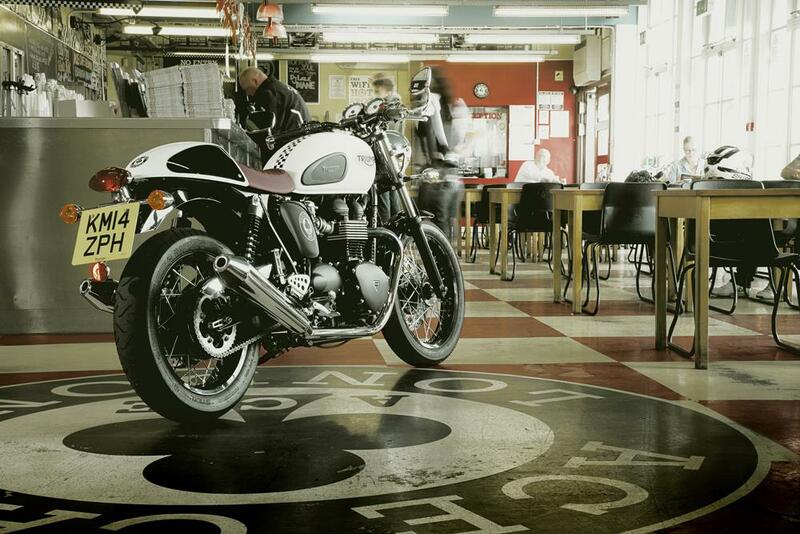 Prices for the Thruxton Ace will be confirmed when the new model goes on sale in UK dealerships in December 2014. 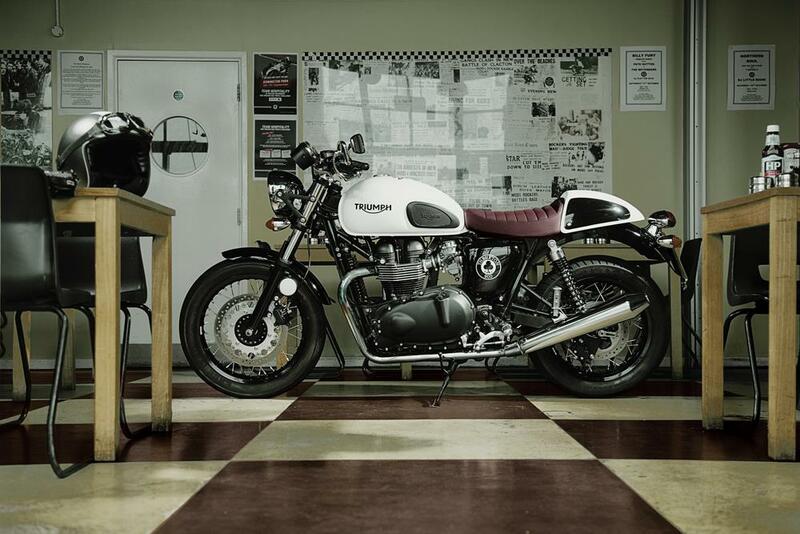 Only 100 bikes will be available for UK customers and deposits are being taken now.